The picture parody features a monk seemingly recreating the famous The Seven Year Itch scene, has been thrown into the limelight after being snapped days ago and posted online. 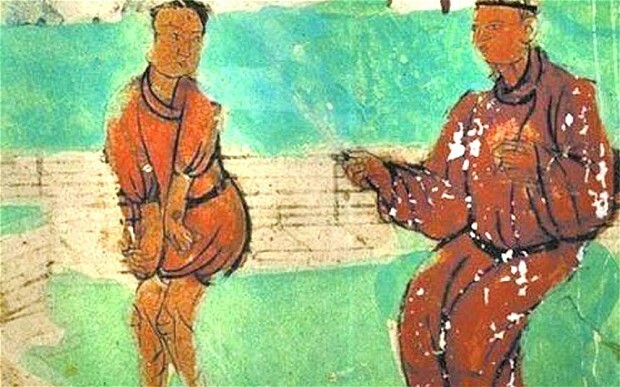 Cultural magazine editor, Chen Shiyu, photographed the painting in the Mogao Grottoes of Dunhuang before uploading it onto douban.com. Thousands of people have now shared the mysterious picture, being dubbed The Unexplainable Dunhuang, along with a snapshot from the hit 1955 film to highlight the uncanny similarities. The film, which contains one of the most iconic scenes of the 20th century, sees Monroe standing on a subway grate as her white dress is blown above her knees by a passing train. But it is thought the mural painter actually drew a scene depicting a master about to physically punish a student who had been misbehaving.